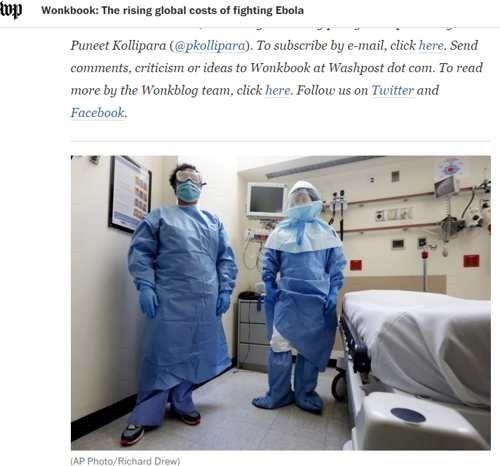 I was looking at this AP photo on the Wonkblog last week of two hospital workers in a room. The worker on right looks like he or she was dressed up to handle Ebola and the person on the left is not. Our hospitals have a severe problem with infection control. The NIH factsheet on sepsis says that the “Agency for Healthcare Research and Quality lists sepsis as the most expensive condition treated in U.S. hospitals, costing more than $20 billion in 20115.” I personally know three people who think they caught MRSA in a hospital or clinic. If you wonder how we can spread Ebola just take a look of the guy on the left. I know the photo is an innocent, staged photo but considering the industry record on sepsis you have to wonder how many hospital workers will have to die before hospitals get their act together. Infection control is only as good as the weakest link. This entry was posted in Healthcare and tagged healthcare, sepsis. Bookmark the permalink. ← Can Public Pensions Be Fair to Later Generations?